Luxury modern detached villa complete with private heated pool (June 2014)situated on the exclusive 5* Mar Menor 18 hole golf resort. The villa has been refurbished to a very high standard catering for every need including golf clubs, rooftop terrace, large outside tiled patio aswell as artificial grassed area . The resort facilities include numerous restaurants and bars, communal swimming pool, supermarket, bank and luxury spa and beauty treatments. El Boulevard located just outside the resort also has several restaurants, bars and a nightclub. An ideal location to explore the beautiful Murcia region. Las Alcazares, a 5 minute drive away, boasts sandy beaches, many bars and restaurants. En-suite bathroom to bedroom 1 with shower and full sized bath, toilet, bidet, vanity unit and heated towel rail. Bathroom 2 has large walk in shower/ wet room, WC, vanity unit and heated towel rail. Spacious lounge with 3 seater leather sofa and 2 leather armchairs, 42" Plasma TV, DVD/CD Player, Internet, radio and iPod docking station. Air-conditioning and gas fired central heating. Patio doors leading to dining area/conservatory overlooking garden. Fully fitted and well equipped kitchen with washing machine, dishwasher, microwave, fridge/ freezer, cooker, ceramic hob, toaster, kettle, glasses, cutlery and all crockery. Everything you could need is provided for a self-catered holiday offering. 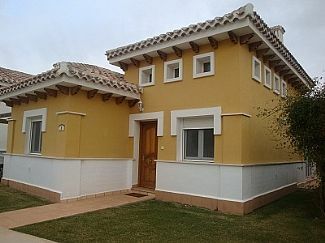 The villa is situated on Mar Menor Golf resort with an 18 hole Par 72 Jack Nicklaus course. There is a driving range and putting green adjacent to the 5* Hotel and club house. There are 2 full sets of golf clubs for guest use with a small deposit. (Please enquire when booking) Mini-buses can be arranged to collect you from Mar Menor and take you to neighbouring courses including La Torre, El Valle or Hacienda Riquelme. The world famous La Manga is less than 30 minutes away as are Campoamor, Las Ramblas, VillaMartin and the championship course at La Finca. Notes on accommodation: New for June 2014 Large heated pool complete with tiled patio for outside dining and BBQ's and artificial grassed area for enjoying the Murcian sun. 2 x full sets of Golf Clubs are also available Outside: Built in June 2014 Large 7m x 4m heated pool with tiled patio offering outside eating area and built in BBQ. Artificial grassed area complete with 4 reclining sun loungers. The rooftop terrace is equipped with 4 chairs, a table and sun loungers. Please note if you wish to use the pool heating there is an additional charge of £10 per day. Cleaning / Towels / Linen / Maid service: All bedlinen and towels are included incl Beach towels for use around the pool area. Property is cleaned on change over, for your arrival and again when you leave. If you would like cleaning during your stay there is a charge paid locally, please enquire. Please note there is an 80 Euro charge payable direct to keyholder to cover laundry and cleaning on your departure. Fantastic villa and pool in a great location close to beaches , bars , rsestaurants etc. Cartegena and Zenia within a short drive , would recommend car hire. Modern and spacious villa with all home comforts to make your stay comfortable . The large pool and garden giving plenty of room for the kids to play , Whilst we were there temperatures in the mid 30s but the air conditionng in the lounge perfectly adequate to keep the bedrooms cool at night . Lovely gated complex with a supermarket a restaurants within walking distance. Worth checking out the community pool at Olivios. plenty to do in the area would recommend mini golf 5 mins away and the outdoor go Karting at Mar Menor. This villa is nicely located on the complex within easy walking distance of the restaurants. The villa is comfortable and well equipped with a larger pool than normal on the complex. We had a couple of issues with things not working or broken and they were resolved by the owner and key holder very quickly. Air con in the lounge is very effective. Would highly recommend this villa. The space is very comfortable for 4 adults; it is nicely furnished and well equipped both inside and outside. The outside space is very generous and the heated swimming pool is a real deal maker - my family made great use of it and even though the weather was very warm it was such a pleasure to slip into the warm pool. I would certainly use this property again and would recommend it without hesitation. Relaxing with a lovely pool. Lots of places to eat nearby. I have just returned from the villa having spent a week there with my wife and two children. The villa was great and extremely comfortable. The garden area seemed much bigger than other villas we visited on the site which meant that the children had a good area to play in. The pool was a good size and was enjoyed by all. The villa was located in a convenient place - only about a 5 minute walk away from the hotel complex. This is a villa (and resort) I would definitely recommend. The Mar Menor, Europe's largest salt water lagoon which contains rich mud full of minerals which can aid skin complaints. It is separated from the Mediterranean by the narrow La Manga strip and is home to lovely beaches and boasts the water is 3 degrees warmer than the Mediterranean. Los Alcazares, a 10 minute drive from the villa has extensive promenades lined with restaurants and beach bars. Shallow water make this an ideal place for families, bathing and water sports. Murcia (San Javier) airport is just 15 minutes away with flights from many low cost airlines including RyanAir and Easyjet. Alicante airport is just 45 minutes away. There are many companies who offer car hire from both airports at reasonable rates including Gold Car and Amigo Car. Cartagena and Murcia are approx 20 - 30 minutes away. Torre Pacheco is approx 5 minutes and Los Alcazares 10 minutes. All times are approximate and are by car. Cartagena is a beautiful Roman naval port with a rich history and stunning architecture, take a trip to the Marina and enjoy a Catamaran trip out to sea. San Javier has a cinema, bowling and lots of places to eat. Los Alcazares has a large square in which you can shop, eat, drink or enjoy the well stocked supermarket. There are large local markets daily within the area to enjoy where you can purchase locally grown produce. The towns and villages in and around the area are unspoilt and remain fully Spanish in character. Murcia is the capital of the region. It sits in a valley and is surrounded by a mountain range and has a mixture of old and new buildings with a good shopping district and places of historical interest. Booking Notes: Please contact Lisa or Mike for further details. All bookings require 25% of total cost as deposit. Balance to be paid 4 weeks before arrival date incl any pool heating (available at extra cost of £10 per day) £150 Security Deposit is payable when paying balance which is 4 weeks before this is fully refundable after your stay. The 80 Euro cleaning is payable in cash and left on site with the keyholder. If this is not left it will be taken from the refundable security Deposit. Changeover Day: Changover day is flexible please contact us for further information. You are able to access the accomodation from 4pm on day of arrival. Departure time is 10am unless otherwise agreed at the time of booking.